This module is part of the On Time feature which allows you to motivate your employees to submit their timesheets on time through a system of points and rewards. You will define here if you want the checks to occur on a daily basis or on a weekly basis. On a daily basis, the system will check if the employees have submitted the hours for the day before. On a weekly basis, the system will check if the employees have submitted the hours for the week before. 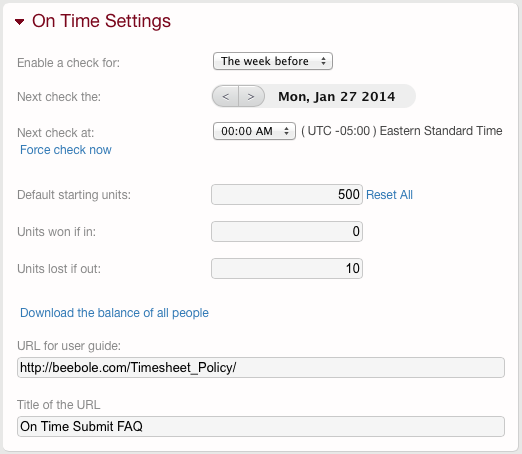 The amount of hours that will be used for the daily or weekly checks is to be defined in the Timesheet Settings module. In the case of a weekly check, if the week includes Holidays, the amount of hours that will be checked for the week will be adapted. For example, if you have set up a weekly total of 40 hours and the week includes 1 day of holidays, the amount of hours checked will be 32 hours. Once the parameter configured, a set of other options/parameters will appear. This field tells you when the next check will occur. The first time you will configure the system, the today date will be defaulted. You can of course set it up in the future, the time for you to announce the new feature to your employees. Each time a check occurs, this date is incremented by a day or a week depending of your configuration. In the case of a daily check, the On Time check will not be performed on non working days. To set up the non working days for your company, please adapt the Localization module. This field allow you to define the time at which the check will occur. The hour is expressed in the time zone of your company. It the tine zone is not the correct one, go to the Settings page of your company and adapt the Time zone field in the Localization module. You can manually force a check now independently of the next check date/time. The manual check will have the exact same impacts on the system than a automated check. Also, you don't have to define a starting amount. 0 might also be your starting point. Will reset all you employees current balance to the amount defined in the Default starting units field. This would be used, for example, once a year to reset all balances to the starting point. Each time a check occurs, if the timesheet was submitted on time, the employee will see his current balance augmented by a number of unit defined in this field. For example, an employee could receive $10 for each timesheet submitted on time. This amount can be 0. Each time a check occurs, if the timesheet was not submitted on time, the employee will see his current balance reduced by a number of unit defined in this field. Allows you to extract the current counters of all your employees. Such a system usually require some additional explanations for the employees that will be specific to your company. If this documentation is available on your intranet, you can define the URL here. This link will then be present in the On Time Submits module available to all employees to follow their current balance. Define here the Title of the link that will appear in the On Time Submits module available to all employees.